SANDUSKY, Ohio — Lake Erie is all about big: big smallmouth, big waves and big stringers. The second 2011 Bass Pro Shops Bassmaster Northern Open will be no exception on two of those fronts, but the weather — and its subsequent waves — is always a wildcard. 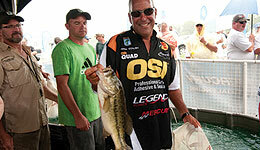 Frank Scalish of Cleveland Heights, Ohio, has enjoyed many successes on Lake Erie. Most notably, in 2009 he took third at a Northern Open there on his way to one of the most dominating seasons any angler has ever put on in the Bass Pro Shops Bassmaster Opens. His performance earned him a berth in the 2010 Bassmaster Classic, which is part of the fire that burns in him to repeat that showing. He expects anglers to catch plenty of fish at this Open, but goes on to say that finding the bigger bites will be key. Anglers are allowed to venture north into Canadian waters and, according to Scalish, they’d be wise to do so. Scalish says that both Pelee and Kelly’s Island (just south of Pelee and north of Sandusky) and the reefs between the two are giving up good bags of fish right now. He also says that there is enough bottom structure to keep an angler busy for three weeks. While the fishing in this large area is good, the trick is getting there and back. The X-factor on Lake Erie is the wind. Regardless of the wind direction (save the east wind), you can duck on the opposite of one of the big islands (Pelee and Kelly’s) and catch fish. However, if an east winds blows one day, there likely won’t be a tournament then. The Pelee and Kelly’s Island areas are no secret, just like the preferred tactics. There are no secrets on Erie anymore; the trick now is to find the right school of fish. “Tubes and drop shot rigs are the deal on the lake; everyone knows it. I can’t imagine it being too much different than that,” he said. The City of Sandusky is hosting this Open, Aug. 25-27, with launches leaving at 6:30 a.m. ET from Shelby Street Boat Ramp, 101 Shelby St., Sandusky, OH 48870. Weigh-ins on Days One and Two will take place at 2:30 p.m. ET at Shelby Street Boat Ramp. On Day 3, the weigh-in will move to 3:30 p.m. ET at the Bass Pro Shops in Rossford, Ohio, located at 10000 Bass Pro Blvd. 43460.